MCRAE -- Eric and Laura Smith’s days are filled with Grace.They remember her gentle laughter and fighting spirit, that her favorite color was purple, and roses were her flower of choice.They do not need to peer into framed photographs to remember how that smile stayed on her face through the good times and helped pull her through the bad.Part of her will always be with them.She loved panda bears. They had planned a trip to the San Diego Zoo, but she was too sick to pack a suitcase. At her funeral, the hearse was filled with stuffed panda bears. A giant panda was placed on the front seat for the ride to the cemetery. Today would have been her 21st birthday.Tomorrow, the first “Day of Grace’’ will be observed.There is no greater grief than a parent losing a child. The Smiths buried their oldest on May 11, the day before Mother’s Day.In the months that followed, Laura and Eric searched their heavy hearts for ways to keep her memory alive.“We wanted to make sure she was not forgotten,’’ said Laura. “A year later, we didn’t want people not to know who she was. This all may sound selfish, but something great will come out of it.’’Today is the actual “Day of Grace” but it was moved to Monday as a way to honor Grace by recognizing others. It is a day “dedicated to demonstrating the value, power and strength of inspiration.’’It works like this: The Smith family is asking everyone to send a purple rose “to the person or persons who have inspired you the most and let them know they have made a difference in your life.’’Florists in McRae, Vidalia, Eastman, Dublin, Alamo, Lumber City and Vidalia are participating. But it is a day that knows no borders or geographic boundaries. If purple roses suddenly become in short supply everywhere else, a rose of any color will certainly work, too.Although it’s a simple gesture of kindness and appreciation “we cannot know how far the ripples travel,’’ Laura said. The Smiths certainly witnessed it firsthand during their 10-month journey with Grace. 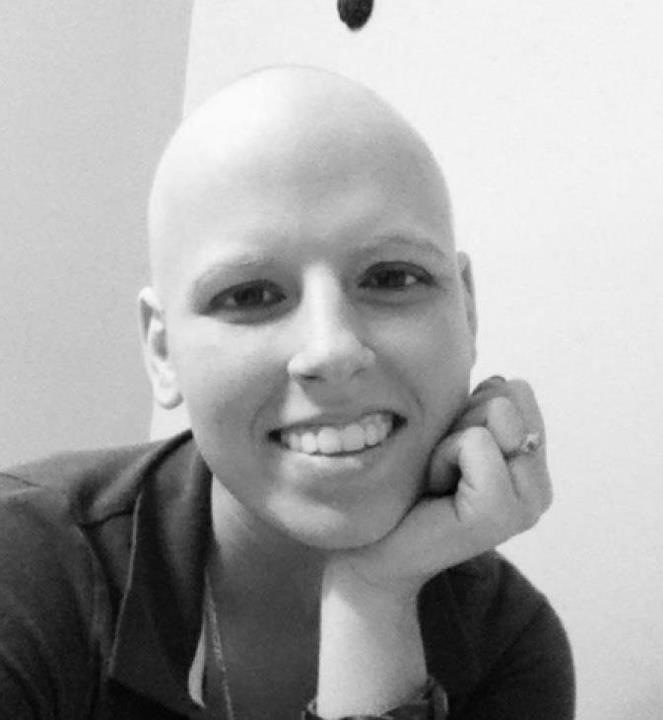 She was diagnosed with a pediatric sarcoma cancer in June 2012, a year after she graduated from Telfair County High School.Folks in the community brought meals, held fundraisers and wore out the floor with their knees in prayer.They cared for the Smith’s three other children when Eric and Laura took Grace to M.D. 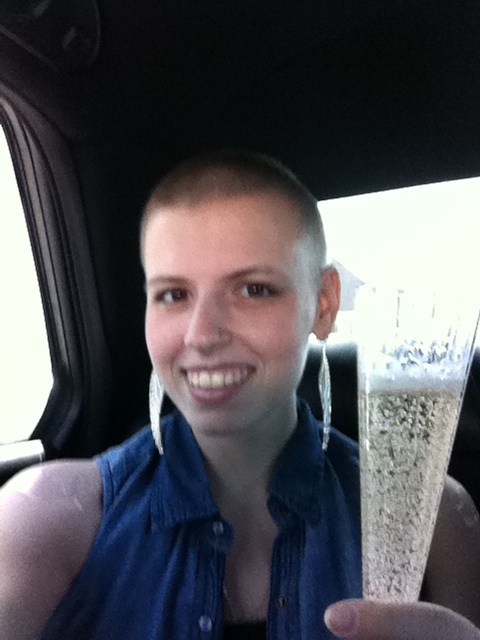 Anderson Cancer Center in Houston, Texas, the week of her 20th birthday. While they were in Houston, all four tires on their car were stolen in the motel’s parking lot. Naturally, people back home rallied behind them when the news drifted 844 miles to Telfair County. But the Smiths were hardly expecting such an outpouring of support from people in Houston. After a local TV station reported their story, there were monetary donations to replace the tires and offers to pay for a hotel room and other expenses.Later, when folks in McRae found out the Smiths had been saddled with so many medical expenses they could not afford to purchase a headstone for her grave, they began raising money by selling deep purple “Day of Grace” T-shirts.Now comes an opportunity for the larger community to recognize those Good Samaritans of the world and pay it forward. Laura created a website (www.dayofgrace.org) and a Facebook page to promote what she hopes will become an annual event. Grace Erin Smith was born in 1992. She was named after Laura’s grandmother, Grace Goss. Erin was derived from her dad’s name. Her family called her Erin until the sixth grade, when she announced she wanted to be known by her first name.She was not without her struggles. She was an imperfect young woman living in an imperfect world. In high school, when her parents did not approve of her circle of friends, she became defiant.“Whatever she believed, she believed it with all her heart,’’ Laura said. “She was not a person who lived halfway in between.’’After Eric and Laura sought to establish household rules, Grace moved out. For six months, she lived with friends. She took a job as a waitress. She did not communicate with her family.Then, one day, someone at the restaurant asked: “Grace, when are you going home?”“I don’t know if they will take me back,’’ Grace said.Of course, they did.“Are you coming as a tenant or a daughter?’’ Laura wanted to know.“A daughter,’’ Grace said.There was a marked difference when the prodigal daughter returned. Her attitude was different. Her countenance had changed. She began calling people she had hurt to tell them she was sorry. She planned to enroll at Georgia Military College in Milledgeville in the fall of 2012.But when the first day of summer arrived, she began experiencing abdominal pain. When Grace Smith woke in the early hours of a smoldering July morning consumed with nausea that left her crippled in pain, the then 19-year-old said she never thought the cause of her illness was a 10-pound tumor continuously growing in her abdomen. Moreover, Grace, a formerly perfectly healthy young woman, hadn’t dreamed of the steep, rocky road she would climb to fight for her survival. But after a surgeon at MD Anderson Cancer Center in Houston, Texas, told her she had possibly eight weeks to six months at the most to live, the Glenwood, Ga., native wasn’t shaken. 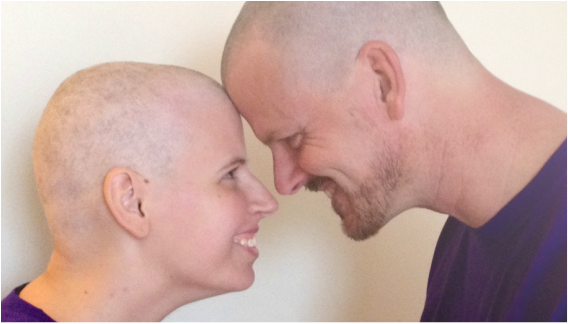 Though she has a very rare type of sarcoma that is “incurable,” she has refused chemotherapy for the time being. Now, Grace, 20, said she relies entirely on her faith in God, and during the nearly nine months Grace has known of her cancer, she said she’s never once been afraid. Grace was born on Oct. 6, 1992, and has lived most of her life in the small community of Glenwood. The summer before she started high school, her family moved to McRae, which is about 15 minutes away. She graduated from Telfair County High School in May of 2012. She said had planned to attend the Georgia Military College in Milledgeville but never had a chance to start. During the summer, while she was working as a waitress at Southern Star Grill, a steakhouse in the tiny town of McRae, she started experiencing excruciating stomach and back pains. Her family began going to Dodge County hospital in Eastman, Ga., where the physician attributed Grace’s trouble to a perforated ulcer. “They thought that maybe some of the stomach acid had kind of leaked through and that’s why she was experiencing so much pain,” said Grace’s mother, Laura. Grace’s father, Eric, said the doctors told them the stomach would typically heal itself, but after two weeks of constant fever and pain she was transferred to Macon’s Medical Center of Central Georgia. “Her white blood count came down, her fever went away, she started feeling better, so we’re thinking, everything’s on the mend,” Laura said. Back closer to home in Eastman, several medical specialists discovered Grace was having female problems, weight issues, her blood sugar had skyrocketed during the last three months and her testosterone levels were high. “She’s getting smaller in her arms and her legs and her face and all, but I told them it just looks like her abdomen is just swollen and I don’t understand.” Grace was initially at a healthy weight of 175 pounds, but to this day, she is wavering at 100 pounds. “We’d been driving up to Macon, and she notices a BB-sized nodule where her diaphragm is,” Laura said. “The doctors, they can’t really feel it.” But Laura, feeling Grace’s stomach, also detected something abnormal growing. “We’re in between doctor appointments and we get the Sharpie out, and I said, ‘Let’s track it,’” Laura continued, her eyes blazing, “because it started out as a BB, but now it’s like a sideways egg. It’s growing that fast through the days. And I’d mark it and I’d put the date on it and I’d outline it and you could actually see the growth. Grace was sent back up to Macon where she got an MRI. After doing scans and tests in Macon, the doctors said the biggest tumor of the three Grace had was 10 pounds. It was growing out of the back side of her stomach, Laura said, and was splitting off and spreading in her abdomen. The doctors surgically removed as much of the cancer as they could in August. The skin of the tumor is very thin, Grace’s parents said, and stuck adhesively to her other organs. 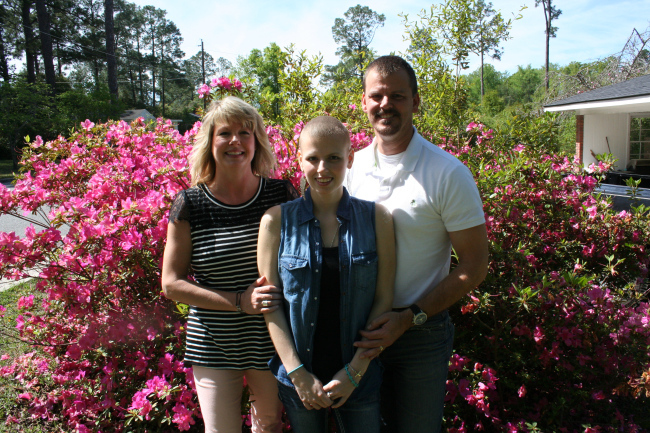 The Macon doctors urged the Smith family to find a sarcoma clinic. Several people referred them to MD Anderson. After doing research, they said they felt a peace about the clinic in Texas. The surgeons at MD Anderson found that by Sept. 24, 2012, Grace’s tumors had already grown back to the size of softballs, so Grace was put on chemotherapy. But soon, her doctors would be surprised in a completely different way. The cancer is unclassified and grows quickly, the family said. Grace’s parents said they found from MD Anderson surgeons that Grace’s cancer is a pediatric cancer that is found in males nine out of 10 times, and world-wide, only eight cases have occurred in five years. “They couldn’t operate. The tumors had grown too big,” Grace said, “And if they did, they’d have to take out more of my stomach, (Doctors removed 60% of her stomach during the first surgery), my spleen, part of my colon, part of my liver and pancreas. That was nearly one month ago, but Grace said she wasn’t afraid. Grace’s parents wrote a song about her fight called “Live, Little Girl, Live,” that is available on iTunes which Eric sang and recorded.The song’s verses come from the words God has spoken through other people, Laura and Eric said, and the chorus comes from a woman’s fervent prayer at their church, World Outreach in McRae. The women of the church surrounded Grace at the alter, Laura said. The family, who described themselves as spiritual and not necessarily religious, looks to God for guidance, they said. Laura has asked her daughter some hard questions. But Grace answered that she wasn’t afraid. Eric said Grace has never used her cancer as a crutch. Grace said she values her God’s voice over the downtrodden vocal tones of men wearing stethoscopes, and at first when she learned they’d given her weeks to months to live, she didn’t want to tell anyone. Now, Grace is on hospice care in her home. Though it seems death is staring her in the face, Grace said she is not afraid because she holds tight to God. Hundreds of people in Central Georgia lost a beacon of strength today. 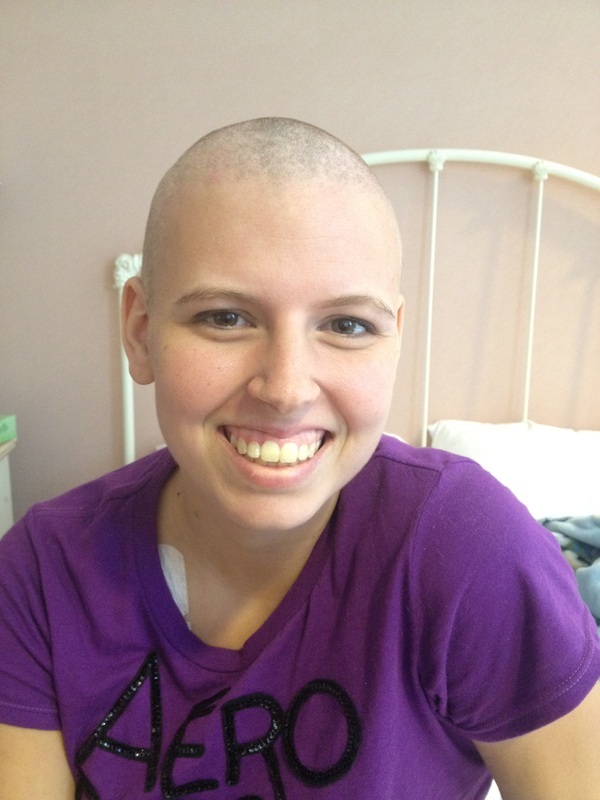 Grace Erin Smith, 20, of McRae, Ga., was diagnosed with an unclassified sarcoma cancer in 2012. After a long, hard fight, Grace died on May 9, 2013. Hearts are breaking across the state for Grace’s family.